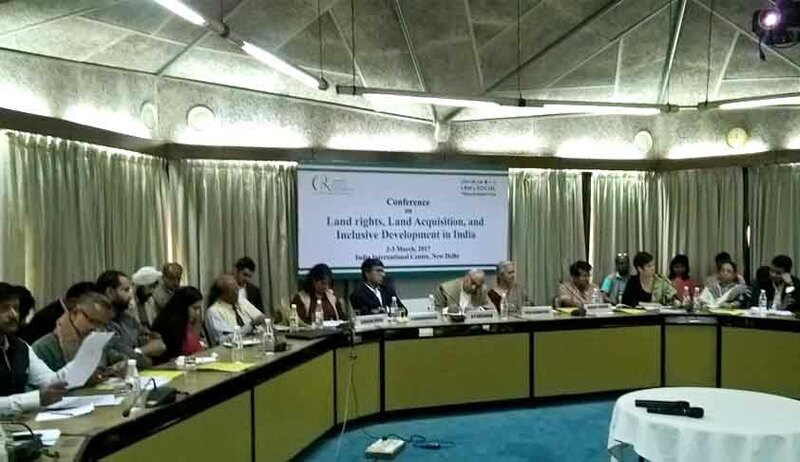 Two Acts passed by the Tamil Nadu and Gujarat Legislative Assemblies, in 2015 and 2016 respectively, to amend the Right to Fair Compensation and Transparency in Land Acquisition, Rehabilitation, and Resettlement Act, 2013 (RFCTLARR Act), came in for sharp criticism at a two-day conference on ‘Land rights, Land Acquisition, and Inclusive Development in India’ which began in New Delhi today. The conference is organized under the auspices of the Land Rights Initiative of the Centre for Policy Research, New Delhi and Centre on Law and Social Transformation, Bergen, Norway. The Tamil Nadu Amendment Act introduced a new section to the Central Act, 105-A, whereby land acquisition carried out under the Tamil Nadu Acquisition of Land for Harijan Welfare Schemes Act, 1978, the Tamil Nadu Acquisition of Land for Industrial Purposes Act, 1997 and the Tamil Nadu Highways Act, 2001 is exempt from provisions of the RFCTLARR Act. It was reported that four-fifths of the land acquisition carried out in Tamil Nadu is through these three Acts, and requirements for consent of the people are absent in all three Acts. The State Amendment received Presidential assent on January 1, 2015, and was published in the Government Gazette on January 5, 2015. The Gujarat Amendment Act,2016, which has also received President’s assent, aims to dilute the stringent provisions in the Central Act and make the “lengthy” and “difficult” process of land acquisition “smooth and easy” since Gujarat is an “industrially progressive” state. The Gujarat Amendment exempts projects that are vital to the national security or defense of India, rural infrastructural projects, affordable housing for poor people, industrial corridors and other infrastructural projects, including projects under public private partnerships from the purview of RFCTLARR Act. This effectively rules out applications of Social Impact Analysis, and the mandatory requirement of consent of the people affected – the two key features of the Central Act. Participating in the discussion, Dr.Walter Fernnandes, Director, North Eastern Social Research Centre, Guwahati, asked how the President, Pranab Mukherjee gave his assent to these two Acts, even though it is obvious that they are derogatory of the Central Act. Under Article 254(2) of the Constitution, where a law made by the Legislature of a State with respect to one of the matters enumerated in the Concurrent List contains any provision repugnant to the provisions of an earlier law made by Parliament or an existing law with respect to that matter, then, the law so made by the Legislature of such State shall, if it has been reserved for the consideration of the President and has received his assent, prevail in that State. A proviso to the Article says that nothing in this clause shall prevent Parliament from enacting at any time any law with respect to the same matter including a law adding to, amending, varying or repealing the law so made by the Legislature of the State. In 1991, the Andhra Pradesh High Court had held that in order to be valid assent for the purposes of clause (2) of Article 254, it must appear that the President was apprised of the reason why the assent was sought ( that is, the State Act was repugnant to an earlier Act made by Parliament), and if there was any special reason why his assessment was sought. Abha Joshi, a visiting faculty in Police Academies of Delhi, Orissa, Madhya Pradesh and Haryana, disclosed another anomaly which the Gujarat Amendment Act exposed. The Gujarat Amendment Act, she pointed out, enables acquisition on the ground of urgency, if the same has been recommended by the Centre. Thus the Centre, which is disabled under its own Act from using this ground for acquisition, will be able to achieve the same purpose in Gujarat, by simply writing to the state Government, as Gujarat Amendment Act enables it. She indicated that the Gujarat Amendment Act is vulnerable for legal challenge, as being unconstitutional, if only someone invoked the jurisdiction of the courts. Earlier, Namita Wahi, Fellow CPR, and Director CPR Land Rights Initiative, and Ankit Bhatia, Research Associate, Centre for Policy Research, gave a power point presentation on the CPR’s report, Land Acquisition in India: A Review of Supreme Court Cases, 1950-2016.